Dreyfus - Joelle Delbourgo Associates, Inc. In the heat of the moment, we can all end up saying things we don’t mean, saying mean things or shutting down completely and saying nothing. But as psychotherapist and couples therapist Nancy Dreyfus, Psy.D., explains in her book, Talk to Me Like I’m Someone You Love: Relationship Repair in a Flash (Tarcher/Penguin, Revised and Expanded Edition 2013), during an argument, no harmony can be achieved unless both people have a genuine desire to connect in a way that feels real. The point is to create a friendlier context between defensive partners so that sharing and listening become purposeful and healing. During a particularly challenging couples session, Dreyfus came up with an ingenious way to get to friendly: While a combative couple sat arguing in front of her, Dreyfus grabbed a piece of scrap paper, wrote “Talk to me like I’m someone you love!” on it, then handed it to the overwhelmed husband and instructed him to hold it up to his fuming wife. Almost immediately, the wife softened, the husband reclaimed his dignity and the two of them began relating like adults. 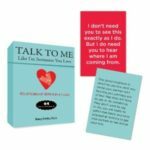 The book is now available in a significantly expanded edition, featuring 25 new “Flash Cards for Real Life,” and has been released also with a separate card pack. Dreyfus’s Flash Cards are a face-saving way to introduce some hard-to-resist goodwill into the mix. And significantly, they eliminate any voice tone or residual exasperation which can undermine even a sincere apology. The messages in the book apply mainly to couples, but have also been quite effective between parents and children, siblings or even close friends. The book groups Flash Cards around such topics such as “Shifting Gears”, “Taking Responsibility” and “Making Up”. Accompanying each Flash Card are “field notes,” explaining where that particular message may be most useful. For example, “You are being a bully” works because it is telling the truth in a non-vindictive or spiteful manner. The receiver will see how rigid he/she is being in comparison to the sender’s gentleness. According to Dreyfus, the applicability of these Flash Cards is universal. Most couples frequently have the same argument, and the Flash Cards allow couples to get beyond the superficial content of the disagreement and get to the real issue that is almost always underneath: how they are relating to each other. “Relationship gridlock, even when seemingly entrenched, can, actually be a springboard to intimacy when compassion is also present. Nancy Dreyfus’s ingenious repair messages are one of the most powerful and gentle ways I know to soften gridlock and get turned-off partners to actually start listening to each other,” says Matthew Cohen, MFT, couples and family therapist. 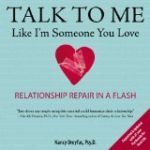 Nancy Dreyfus’s “Relationship Repair in a Flash, is a next-generation relationship tool meant to lead couples into a place of non-defensiveness and maturity—the place where real intimacy flourishes.